Le Dominator 680 est un motoryacht parfait afin de partir à la découverte des Iles grecques des Cyclades ou du Dodecanese. This Dominator 680 was built in 2008 by Dominator. With its 2 crew members, she welcomes up to 6 passengers on board to explore Cyclades and Dodecanese. 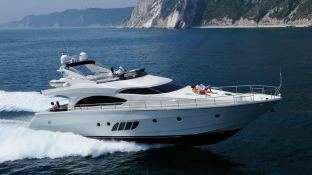 This Dominator 680 can reach a cruising speed of 8 knots thanks to its 2 powerful 1360 hp engines. This 680 yacht available for charter in Cyclades and Dodecanese is fully equipped with air conditioning, BBQ, bow thruster, generator and also fishing equipment, jetski, CD and DVD for leisure. 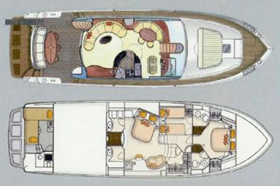 This motoryacht is available for yacht charter with a base price of 18 900 € (approximatly 21 315 $).